Icicle Creek isn't. When I first got a glimpse of this 'creek' it looked an awful lot like a river to me, though it does pale in comparison to the mindbending cataracts in nearby Tumwater Canyon. Icicle Creek rushes down an airy canyon near the town of Leavenworth in Washington's Cascade Mountains. 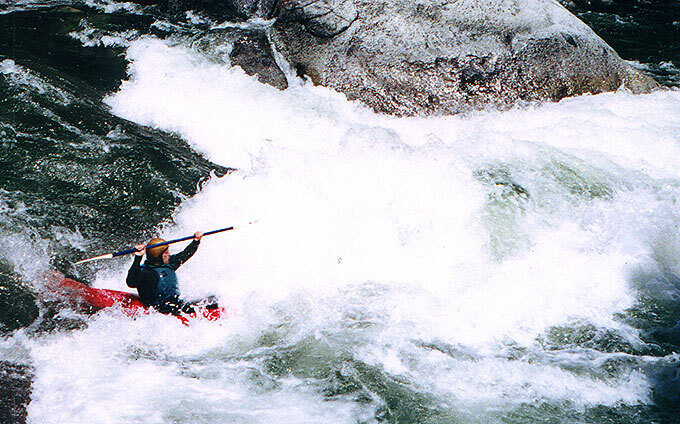 The creekbed is filled with granite boulders which create long, powerful rapids with some pretty burly holes. 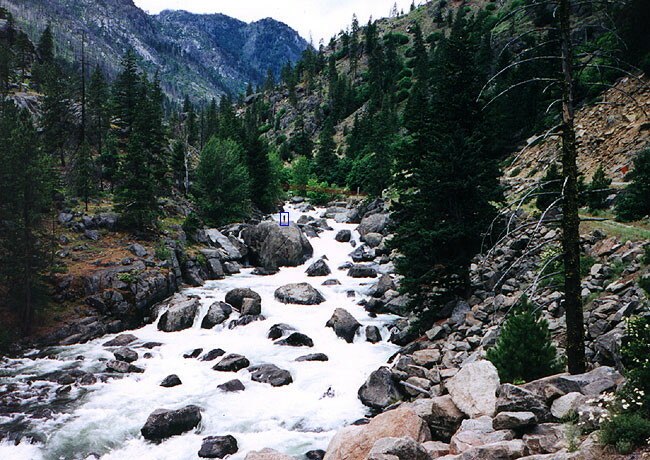 The area around the creek is wildly scenic with broad swaths of granite teeming with climbers and an equal number of hikers, bikers, and other more mundane looky-loo's. It was early June and we were taking a rest day during a road trip, looking for an easy run after paddling some grippy class five. 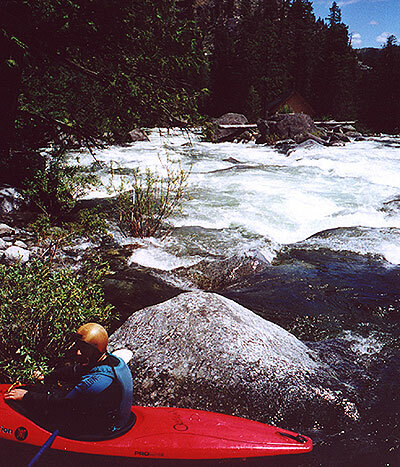 We drove up to Icicle and decided to run the lower IV+ section in spite of the estimated 1500 cfs of snowmelt that was rocketing down the riverbed below us. ('Rest' is not what Icicle had in store for us at all!) John doesn't like Icicle because of the recent drowning here and the fact that one of the best boaters he knows narrowly escaped a flush drowning after he swam in a hole here... Nevertheless, we had driven a long way so he reluctantly agreed to go after I ruthlessly bribed him with some microbrews. Just upstream from the put-in the river thunders down through a class six cataract that is mighty impressive to look at. This is the climax of the upper run, which is supposed to soar well into the range of hard class five. We weren't interested in anything that hard though, so we wrestled our boats down the granite boulder field at the put in and were off in a rush. The Cataract just above the put-in. There were two hikers scrambling around on one of the mega-boulders when I took this shot- I have highlighted one of them with a blue box for scale. The red band crossing the creek just upstream is a hiker/sightseeing bridge. John eddy hopping down the upper section. 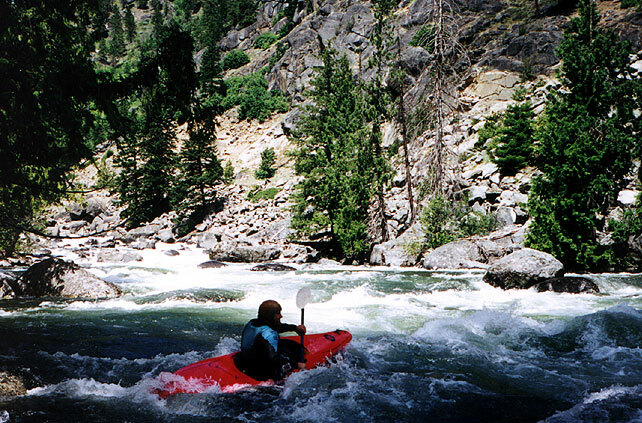 I followed, had no problems, then followed John as we blitzed down through the lower rapids. It was a beautiful day, so we took our time and scouted often. Eventually the creek mellowed a bit and we were able to boat scout all the way to the reservior. Hole avoidance is the name of the game on this creek- Here John punches the shoulder of a burly one on Lower Icicle.